Liz: Thanks to Jaz for suggesting this movie, as well as the alternate sound track (which was very enjoyable) (Jaz: soundtrack was by Voices of Light). 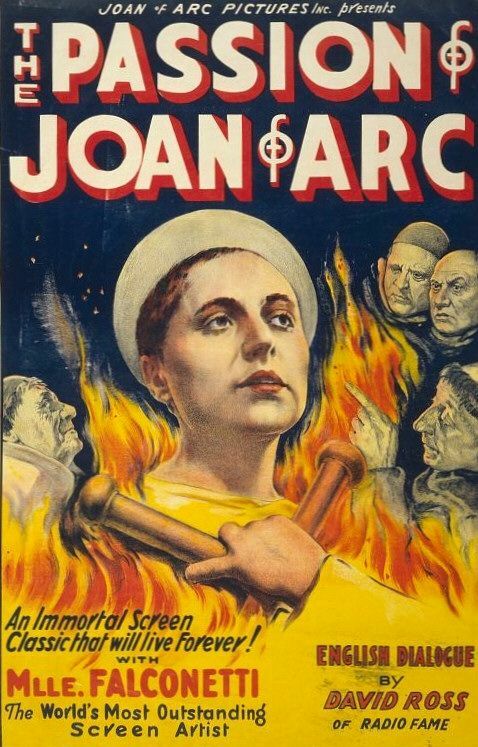 The Passion of Joan of Arc (1928) tells of Joan’s trial and death at the stake and is one of those movies I’m glad I watched but wouldn’t want to watch again. I learned from it, was depressed by it, and, after watching it, felt the need to watch something cheerful and unrealistic (as in a movie where everyone lives happily ever after and where no one would ever burn a person alive). I was surprised by the quality of the movie—the acting, the clarity, and the lack of dark makeup and exaggeration common in silent films. Maria Falconetti did an excellent job of portraying Joan. Her facial expressions conveyed her emotions so well, she had little need for speech. I must add that if Joan hadn’t fainted at the site of the torture instruments being readied for her, I would have. The judges, already easy to dislike because of their obvious predetermination to convict Joan, were made even less likeable by being portrayed by unattractive men often shot in intimidating close-ups. Other than it being a depressing true tale of a woman’s death (never a favorite storyline for me), it was well-done. My negative comments are these: too many close-ups, it was missing some subtitles, it was long (I must admit that I skipped some of it), and too time spent with the characters looking at each another. Jaz: If you’re looking for harrowing scenes and emotionally haunting close-ups, look no farther than 1928. Forget about the undeserving Les Misérables. The Passion of Joan of Arc is the true master of the art. What struck me about this film was its clarity. Every wrinkle, every spot, every glance of the eyes – especially those of gifted actress Maria Falconetti – are recorded in astounding detail. I also noticed many of the camera angles focused on the assembly were shot from below, while those on Joan were from above. It gives a sense of the judges’ intimidation and power and Joan’s contrasting humility. Joan of Arc’s shots mostly depict her in tears or wide-eyed anguish – a stark contrast to her battle-related history (not shown in the film). Watching this film made me wonder how close it came to the actual trial. Googling “trial of Joan of Arc” immediately brought up the translated text. While I just skimmed over it – it’s lengthy – I noted the judges in particular focused on her style of dress and why she didn’t perform “womanly duties.” Her response? There are enough other women to do them. Other things I discovered: she was a skilled sewer and owned over a dozen horses (5 chargers and over 7 hackneys). 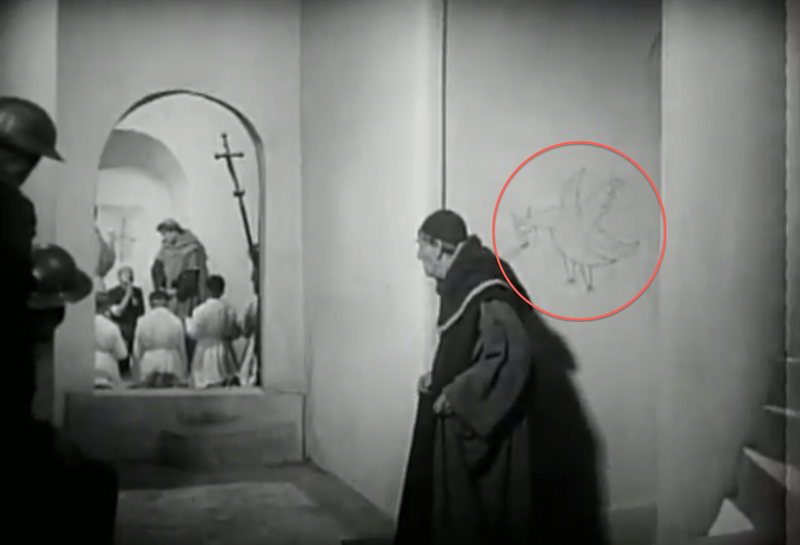 One thing I noticed in the film was a drawing of a winged dragon-like creature on one of the prison walls. It was shown twice. In a film with this much dedication to detail, I’m sure it’s of significance – but of what? To summarize, this isn’t the kind of film you watch for trivial entertainment. It’s deeply moving, graphic (the bloodletting scene is real), and you view with the knowledge that there will be no happy ending. But it’s the kind of film you’ll never regret watching.